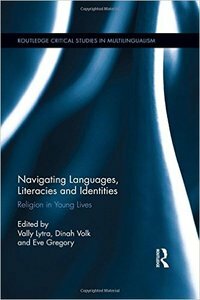 Navigating Languages, Literacies and Identities showcases innovative research at the interface of religion and multilingualism, offering an analytical focus on religion in children and adolescents’ everyday lives and experiences. The volume examines the connections between language and literacy practices and social identities associated with religion in a variety of sites of learning and socialization, namely homes, religious education classes, places of worship, and faith-related schools and secular schools. Contributors engage with a diverse set of complex multiethnic and religious communities, and investigate the rich multilingual, multiliterate and multi-scriptal practices associated with religion which children and adolescents engage in with a range of mediators, including siblings, peers, parents, grandparents, religious leaders, and other members of the religious community. The volume is organized into three sections according to context and participants: (1) religious practices at home and across generations, (2) religious education classes and places of worship and (3) bridging home, school and community. The edited book will be a valuable resource for researchers in applied linguistics, linguistic anthropology, socio-linguistics, intercultural communication, and early years, primary and secondary education.